Next I grabbed a few of the 6 x 6 papers from that amazing Paper Pad and trimmed down a piece that would fit the front left panel. Before I adhered it down, I edged it with my brown chalk ink pad. I took my second piece of paper from the 6 x 6 Paper Pad and trimmed down a piece to fit the right hand side panel. Once again I edged the paper with my ink pad before adhering it down. I left the card empty inside to write my note! I used several of the Silver embellishments from Queen & Co.! 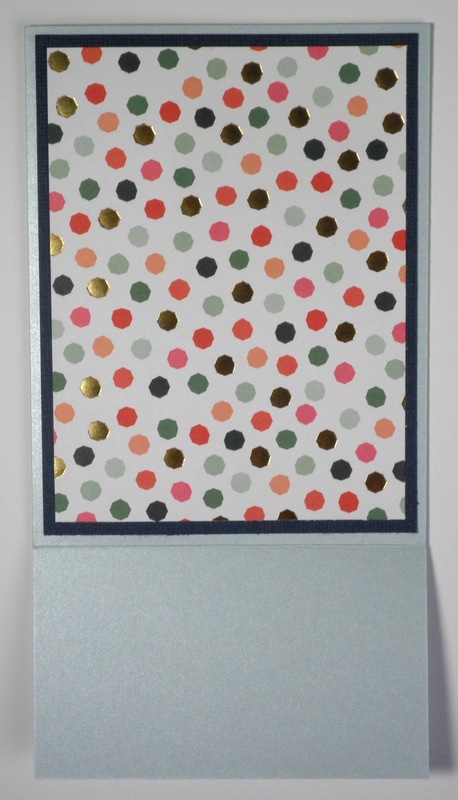 Those pearls add just the perfect touch to any handmade card!!! 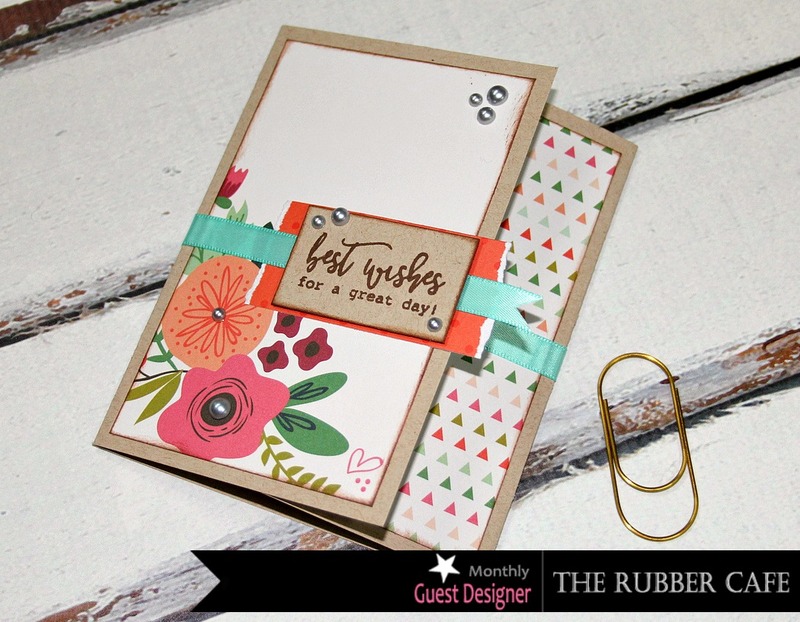 Hope you were able to grab some inspiration from this blog post to create your very own tri-fold card! 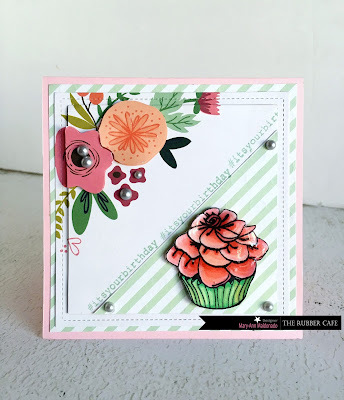 I am sharing my second card created with the March Creative Cafe KOTM called Special Celebration. 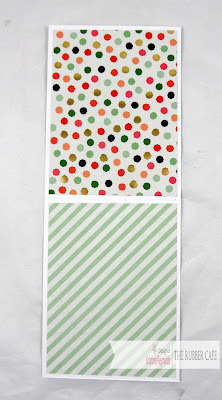 I love the colors in the My Mind's Eye 6x6 patterned paper pack. It helps bring life to the stamps if you want to keep things simple. My card base is 5x5. I layered the stripped paper 4 3/4 x 4 3/4 and then the small floral paper 4 1/2 x 4 1/2. I cut a 4 1/4 x 4 piece of green striped and split it at 1". Leaving a space as shown. I used a die and my Big Shot to cut this circle. You can use a cup and trace it, a punch or anything you have handy. Use a square if you want! I did back this with foam. On the white cardstock, I stamped frosting part of the cupcake, 3 times. Using the candle part several times as you see here. I stamped the bottom part on the striped. I colored the frosting with a light pink and used the provided pen for effect. I fussy cut all the pieces and backed them all with foam for dimension. Before adding this to my circle, I wrapped the pink ribbon around and tied a bow. Simple but adorable. Look forward to see you again next week. Hello everyone! 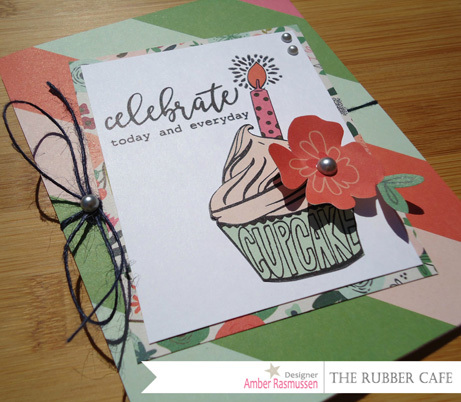 It's Amber here, today I'm sharing another fun card I created with this months Creative Cafe Card Kit- Special Celebrations. 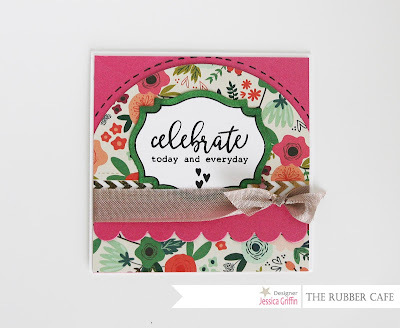 This card is all about the stamps and patterned paper that can be found in the kit. Below you will find a quick step by step tutorial. Step 1. I started by folding an 8 1/2" x 5 1/2" piece of white cardstock in half to create a 5 1/2" by 4 1/4" card base. Step 2. 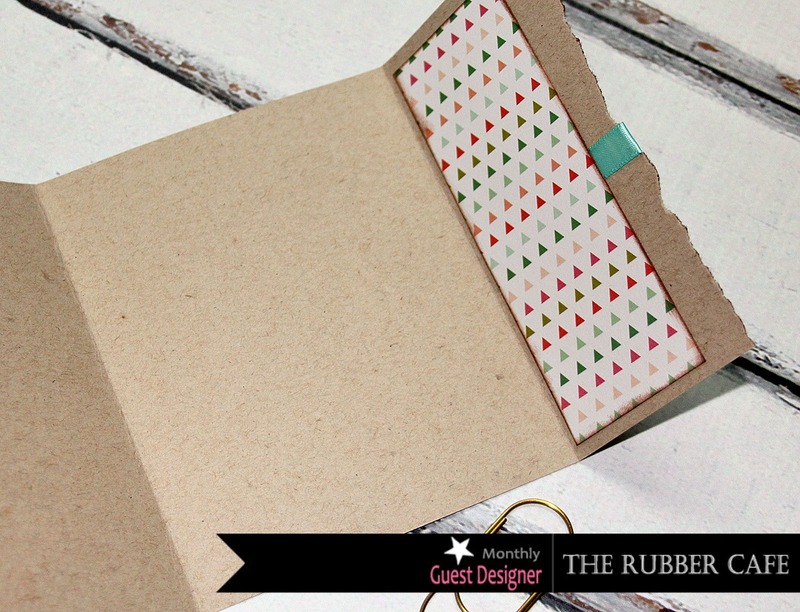 Cut a 4 1/4" x 5 1/2" piece of patterned paper, this will cover the base of your card. Before adhering it to your card base wrap a piece of blue twine around your patterned paper and tie a bow off to the left side. Step 3. 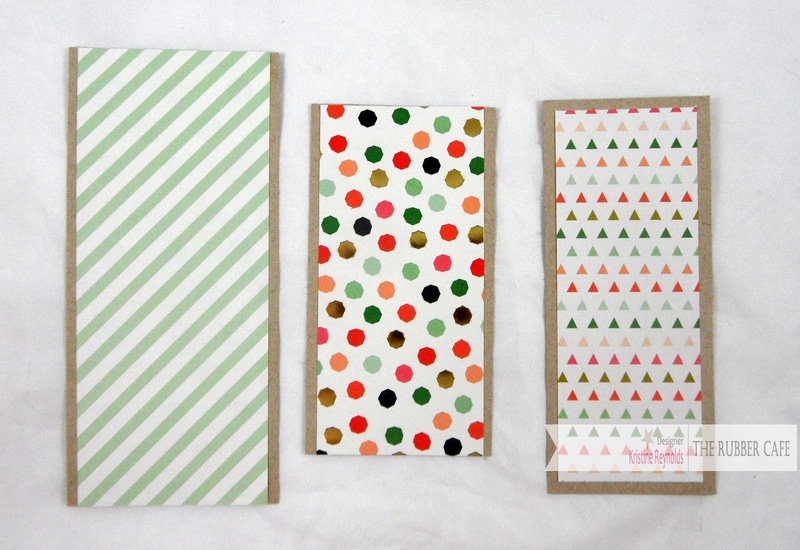 Cut a 3 1/4" x 4" piece of coordinating patterned paper, set aside. This will be used to mat your stamped panel. Step 4. 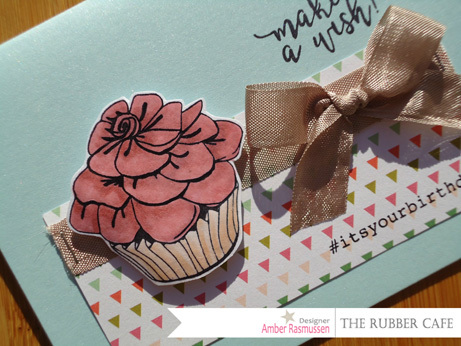 Cut a 3 3/8" x 3 3/4" piece of white cardstock, stamp your cupcake image and sentiment. 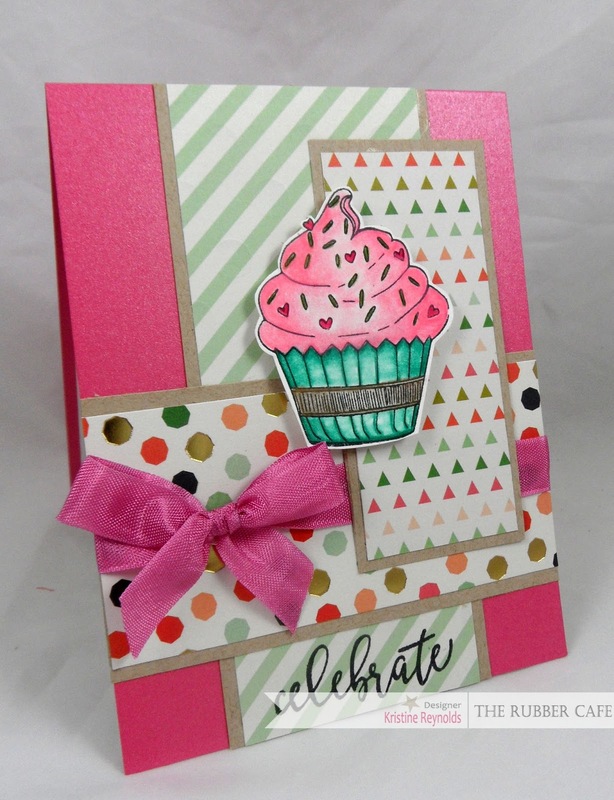 The cupcake image and sentiment I used is from the #EatCake set. Step 5. Paper piece or color your image. 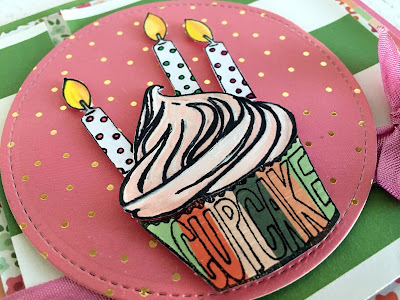 I wanted my cupcake to coordinate with my background patterned paper so I paper pieced my cupcake with some patterned paper from the 6 x 6 paper pad. Step 6. 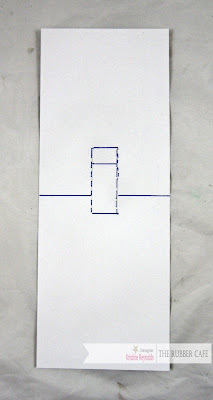 Adhere your stamped panel to the piece of patterned paper you cut and set aside in step 3. Step 7. Adhere the whole panel at a diagonal to your card base. Step 8. Fussy cut one of the flowers from the 6 x 6 On Trend paper pad and adhere it to the right side of your cupcake. Step 8. 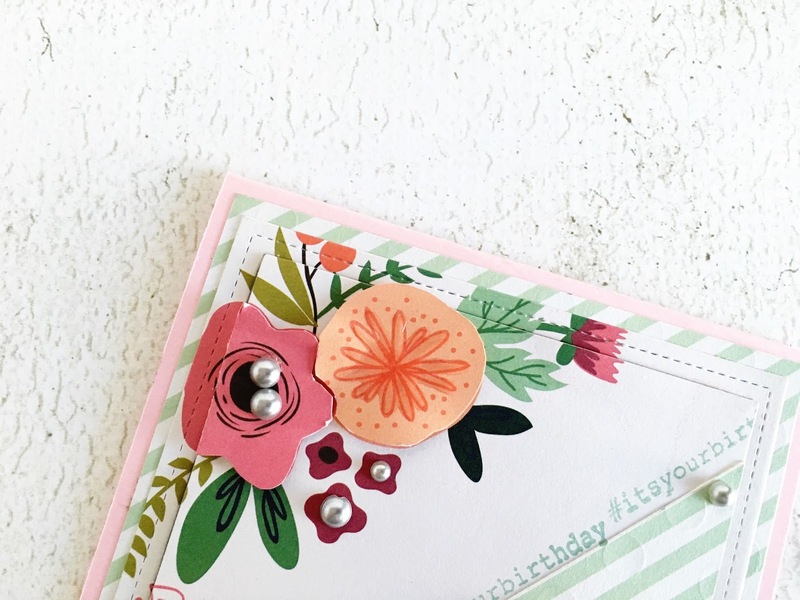 Add some Queen & Company Sliver Pearls to the center of your fussy cut flower, bow, and the upper right side of your stamped panel. That's it your finished. You can check out a close up below. 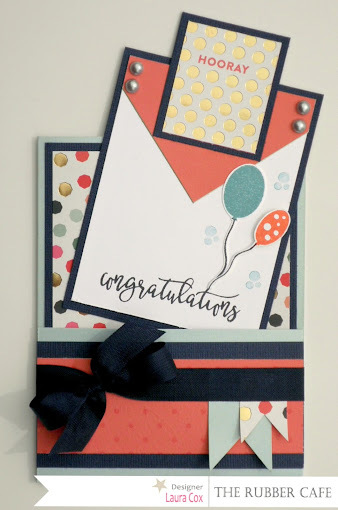 I hope you enjoyed my card and step by step tutorial today. Thanks for stopping! Hi, TRC Fans!!! It's Candi here today and I am SO excited to be the March 2016 Creative Cafe KOTM Guest Designer!!! 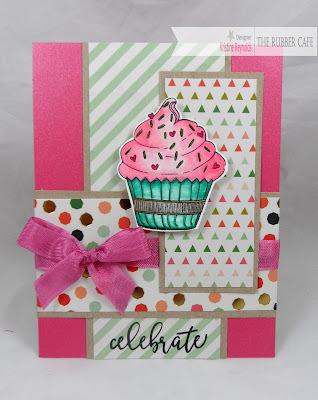 I was super thrilled when I found out that there were cupcake stamps in this months kit :) those tasty little treats are my fave! First thing I did was stamp out Happy Birthday several times using a brown ink pad. I tore off a tiny bit along the front side of the card to give it rough edge. On the edge, I rubbed my brown ink pad to make it pop a bit. For the inside of the card I trimmed down a little strip from the 6 x 6 Paper Pad and adhered that down...I like the color peeking out a bit! 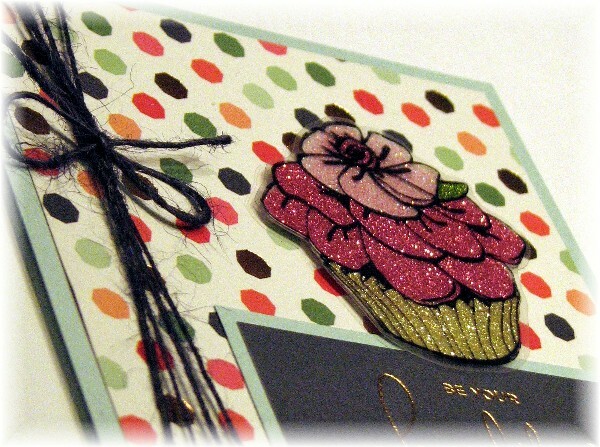 I love how this cupcake just P O P S off of this card! Hello, Jessica here! 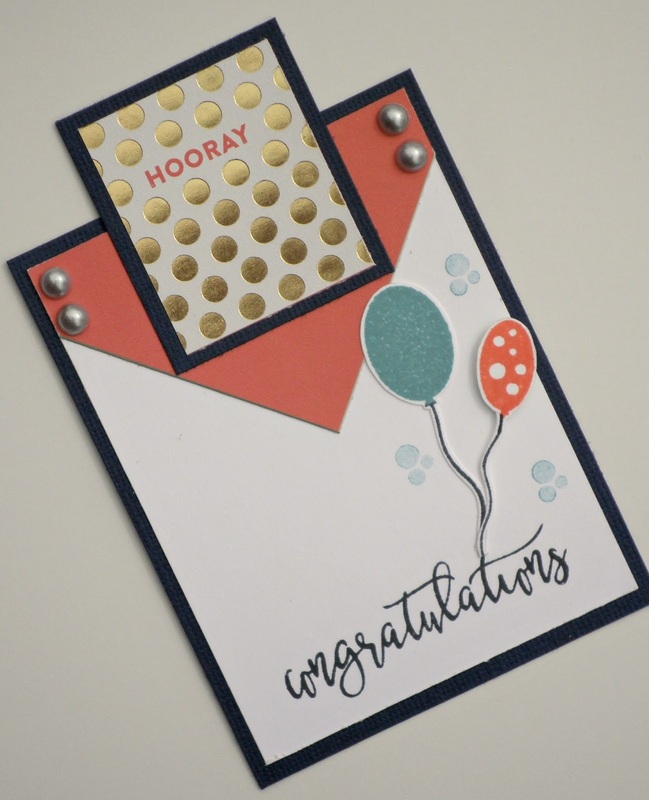 I created a fun card with products from the MarchCreative Cafe Kit of the Month called - Special Celebration! 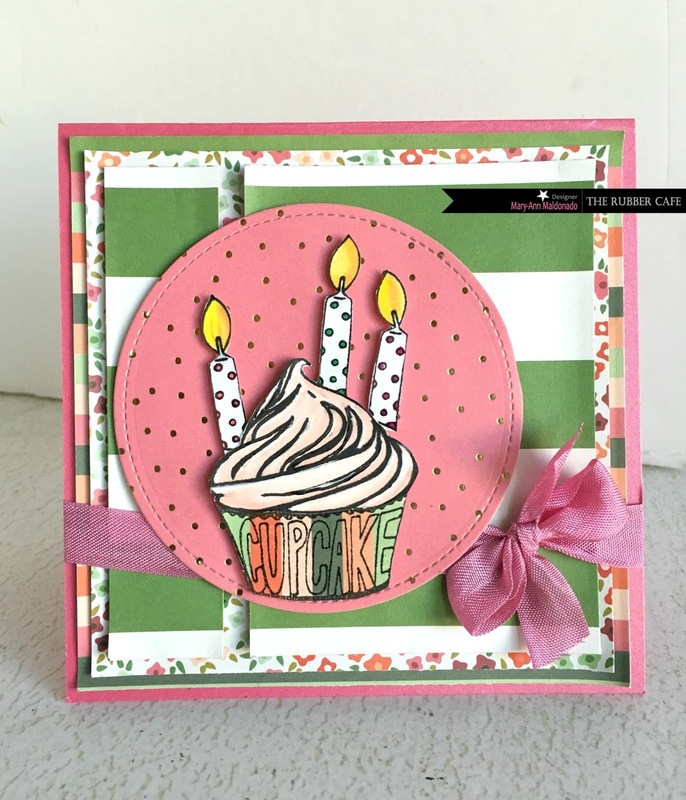 Today I'm using the fun set, #eatcake! I used several layers to create this card. However it's very simple. Ready? First, the base layer. For this card, my base layer is the pink cardstock. I cut it to 3 7/8"X3 7/8". (My card is 4"X4".) Then, I cut the floral patterned paper to the same size, 3 7/8"X3 7/8". 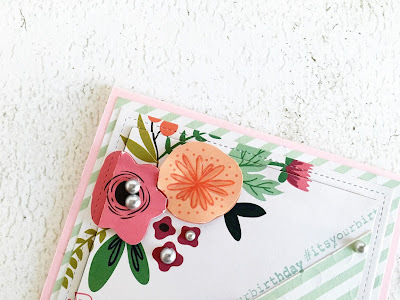 Using my circle die, I placed the top part of the patterned paper UNDER the die, and the bottom part of the paper OVER the die. This allowed me to create the rounded edge at the top of the patterned paper. While the paper was still in the die, I placed it on top of the card stock, ensuring the bottoms lined up, then I drew the dotted lines using my .05 multiliner. 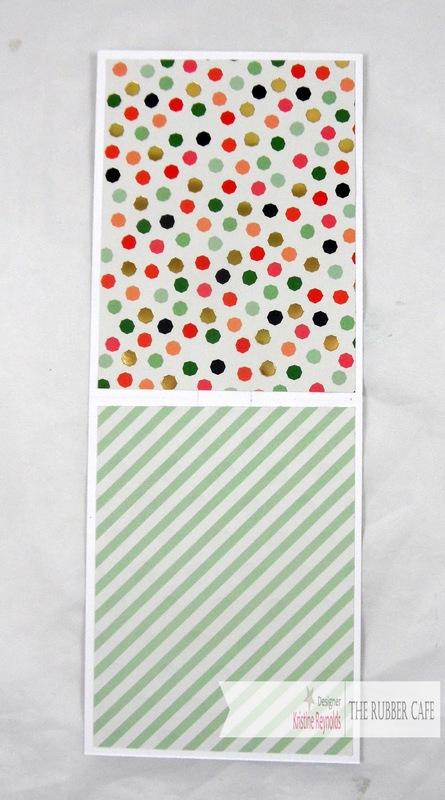 I adhered the patterned paper to the card stock and wrapped some washi tape (from February's KOTM) around the card. 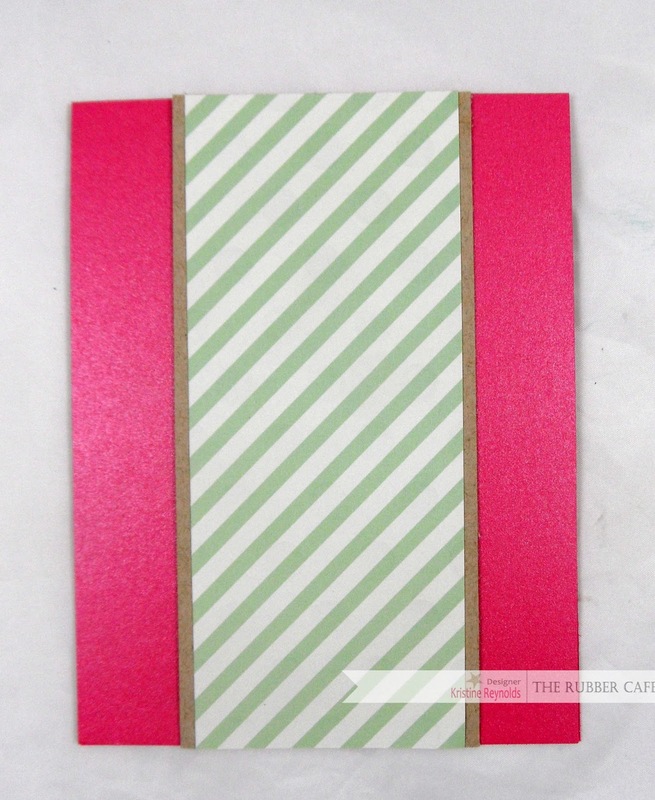 Using the pink card stock, I cut a border and placed it just below the washi tape. Then I wrapped some ribbon around the washi tape and the border and tied a knot. If you did not receive the February KOTM, you could use any of the patterned papers in the kit for the same effect. The sentiment is my favorite part. I love creating cards where the sentiment is the focus. I used my dies to cut the shape. While the shape was still in the die, I used my .05 multiliner to create an edge. I used my Copic Marker, G28, to color around the edges of the cut shape. Then I stamped the sentiment using VersaFine in OnyxBlack. It may seem a little backwards, but I like to put the card face together first, and then adhere it to my card base. I feel like it is a cleaner look on the edges and inside of the card. Ink: VersaFine in OnyxBlack, Copics, Multiliner. 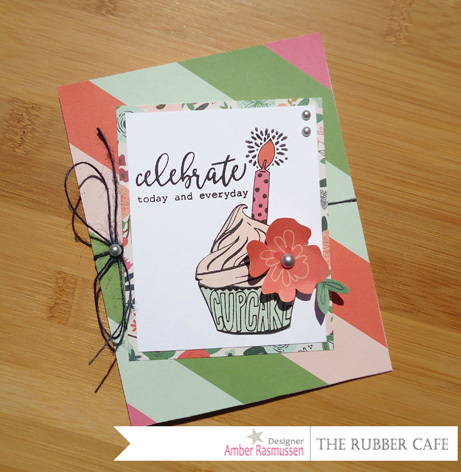 Stamps: The Rubber Cafe's- Special Celebration #eatcake. Paper: The Rubber Cafe' KOTM--My Minds Eye On Trend 2, Pink Pearl cardstock by Bazzil. Embellishments: Washi tape, ribbon, and dies. Hi everyone! 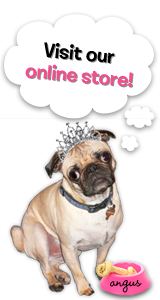 Do you like giving a gift card as a gift, but want to make it extra special? Sometimes a gift card can seem a little impersonal, but when you create a fun homemade card to put it into, then it's appreciated all the more! 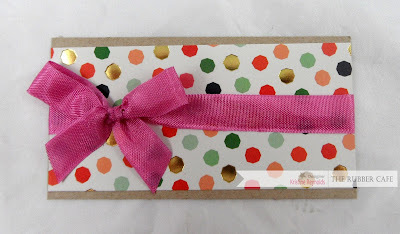 It's a simple fun fold card, that has a cute tag either for fun, or it could be a bookmark, or better yet, you could attach a gift card to the back of the tag tucked inside. 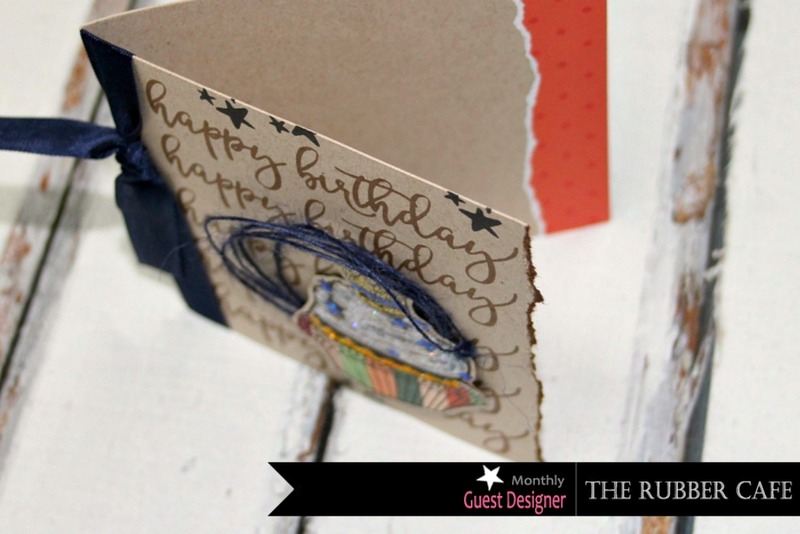 Add double stick tape to very edges of the flap and fold up to adhere to card front and create pocket. 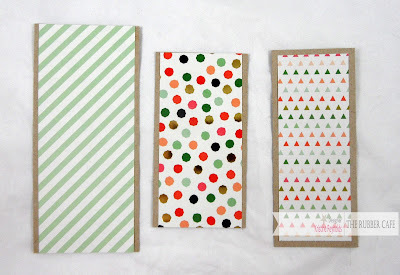 To decorate outside of pocket, cut 4&1/4" by 1&1/2" piece of peach dot paper, and mat on a 4&1/4" by 2" piece of navy cardstock. Tie seam binding around this piece and tie a bow. Glue to pocket front using Scrap Happy Glue. Cut out 2 banners (one out of green mint pearl and one out of confetti dot) and glue under ribbon. To create the tag, cut a 4" by 3" piece of white cardstock, and mat it onto a 4&1/4" by 3&1/4" piece of navy cardstock. Stamp sentiment at bottom edge using Memento Black Tuxedo ink. Trim triangle from patterned paper, trim to fit 3" wide card at top and glue. Cut hooray gold dot piece out and mat on navy cardstock, glue to the top of the tag (it stick up over the top about 1/2"). Stamp balloons using Iced Spruce and Ripe Persimmon Distress Ink and Black Memento for the strings. Fussy cut these out. Glue to the tag, use foam tape under the peach balloon. 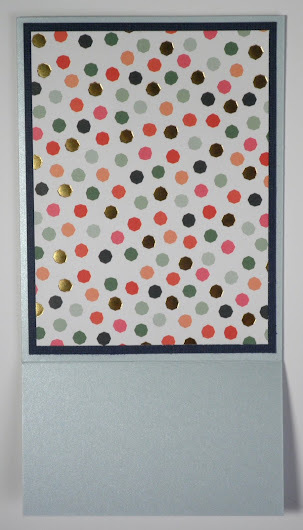 Stamp "sprinkle dots" in coordinating ink (I stamped off here to give a lighter look). Add pearls. Thanks for stoppin' by today! This kit is so amazing, it's easy to get creative! Hello! 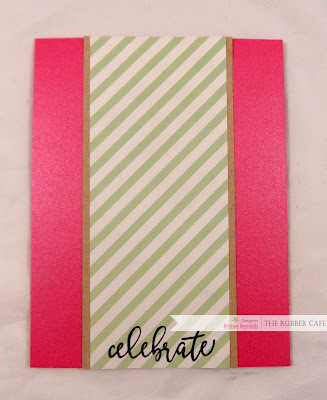 I'm so excited to share my first card from the new March Creative Cafe KOTM called - Special Celebration. 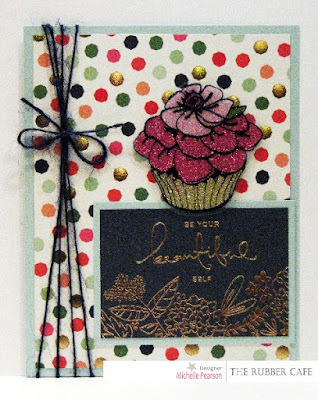 I used the add-on stamp set called "Little Cupcake." The beautiful papers in the My Mind's Eye On Trend 2 paper pack included in the kit have gold foil accents that just called to be paired up with You're So Fine Glitters! 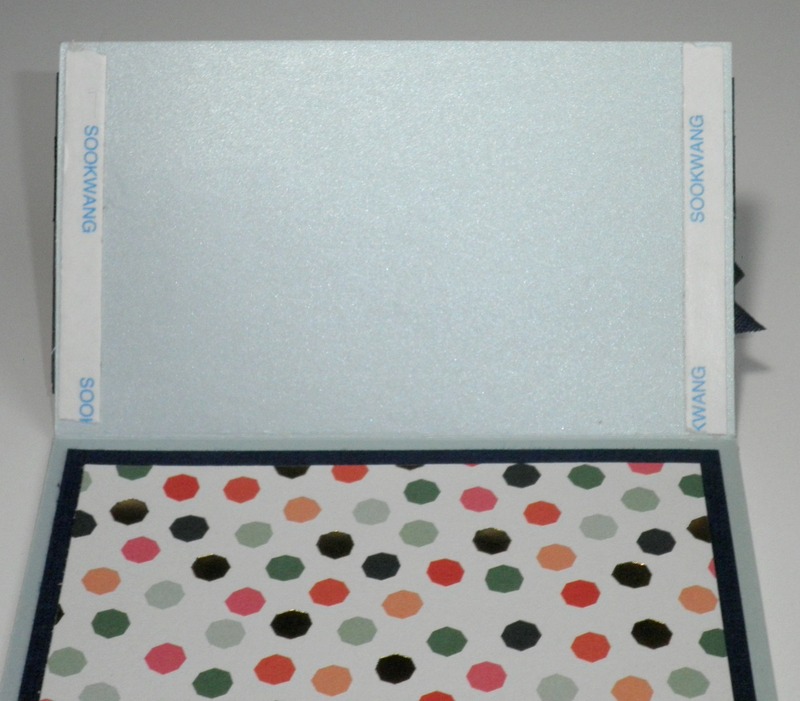 The card base is 4 1/4 x 5 1/2 of the light blue shimmer cardstock. I selected one of the designer papers from the pad and cut it to 4 x 5 1/4 inches. I wrapped the panel several times with the navy twine and tied a bow. Now the panel can be attached to an A2 folded card. I cut out one of the cardstock elements to use a base for my cupcake. I matted it on a 3 1/8 x 2 1/4 inch piece of the light blue shimmer cardstock and attached it to the card as shown. 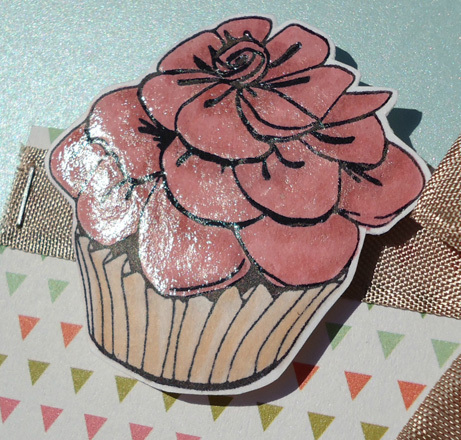 For the cupcake, stamp it on a piece of acetate with black Stazon ink. Once dry, flip it over and apply You're So Fine Sheer Glue to the back of the image with Tiny Detailer Kit as desired. I used Gold Medal glitter for the wrapper, Limeade Green glitter for the leaf, Princess Pink glitter for the lower flower petals. TIP: The lighter flower petals were made by using Diamond Clear Cool Highlight glitter and then dusting it with the Princess Pink glitter while it was still wet. Finally, I fussy cut the dried glittered image out, leaving a narrow border around the image. TIP: To make the glittered piece look more opaque and brilliant, stamp an identical image on white cardstock and cut it out just inside the outer line. Adhere your glittered piece to the top and then you will have a brilliant and sturdy element to add to your creation! I added the image to my card with a bit of foam tape for dimension. 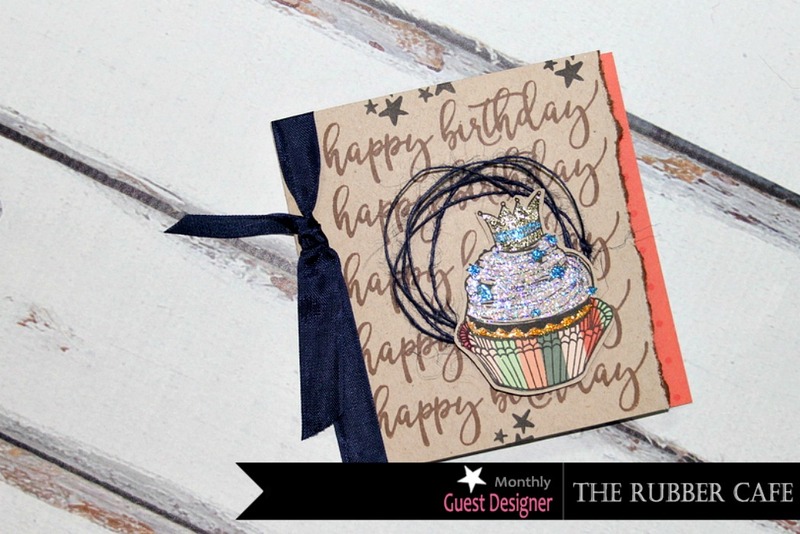 I am excited to share the first card I created with the March Creative Cafe KOTM called - Special Celebration. I used the add-on stamp set called "Little Cupcake." This kit is full of delicious cupcakes, that can be decorated for each persons taste. WARNING: It WILL make you hungry! 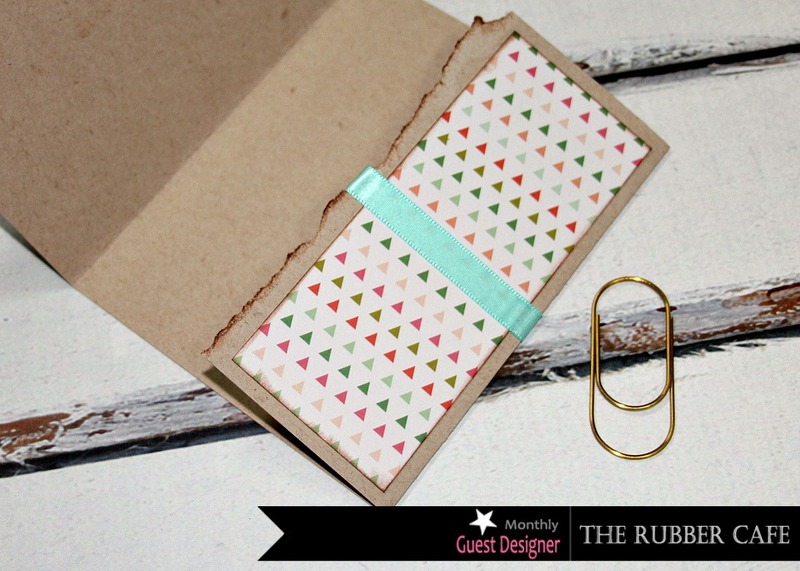 It is paired beautifully with On Trend 2 by My Mind's Eye 6 x 6 paper pad and Queen & Co. enamels. Let's take a look at my card and then I will break it down for you. 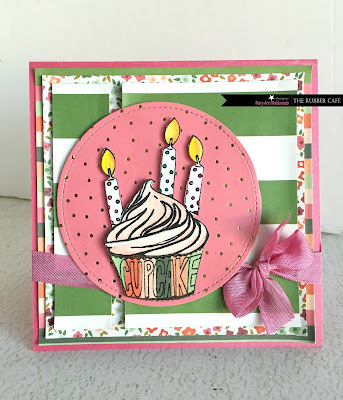 I started with a 5x5 card base in pink. Cut a 4 3/4 x 4 3/4 block of mint green and white striped and added to pink card base. 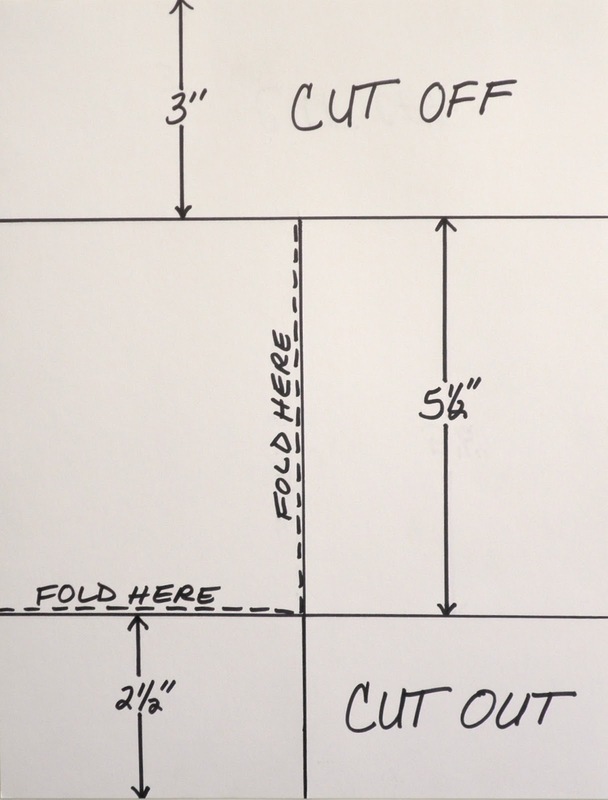 Cut a 4 1/2 x 4 1/2 corner floral paper as shown. I cut the inside of same paper 4 1/4 x 4 1/4. I applied the remaining thin layer on the stripped and then backed the inside paper with foam and added to the center of that. You see stitching around the thin paper, I cut this with a die. TIP: You can sew yours to get the same effect without any thread! Do this before adding foam raised paper square. I cut out and raised the flowers with foam and adhered back where they came from. Added pearls for decor. At the last minute, I wanted more mint to the top of the card. I cut a triangle and adhered as you see. I stamped with mint green along the line provided by the triangle. On the extra white cardstock, I stamped this beautiful cupcake from the add-on stamp set - Little Cupcake. 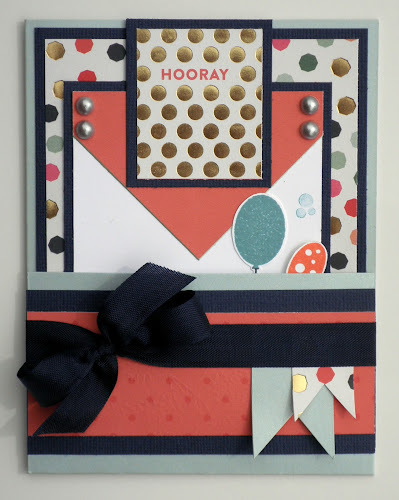 I colored with copies and then added glossy accents to the top and waited for it to dry before adding to the card. Last but not least, I added enamels for extra pizzaz! Keep checking back, our new designers have joined us as we are designing like crazy behind the scenes! Hello! Don't you just love to celebrate a birthday with a beautiful cupcake? I know around our house that is usually the chosen dessert for a birthday. 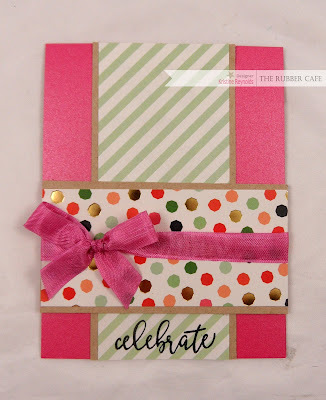 So today I have a fun card to share with you using the March Creative Cafe' Kit - Special Celebrations. I used the main stamp set - #EatCake for this card! 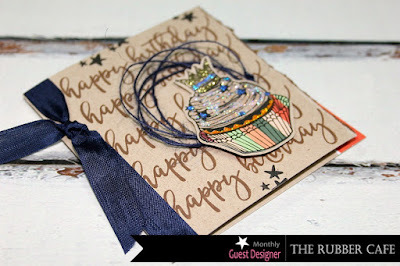 This month's kit is full of fun images for that special someone's birthday or other celebration! Thanks for stopping by today! Hello TRC Fans! It's Amber here with my first post as a Rubber Cafe designer. 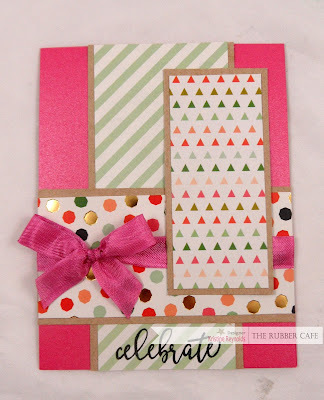 Today I have a fun Birthday card to share with you using the March Creative Cafe Kit - Special Celebrations. 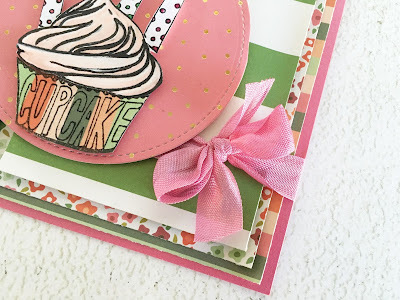 For this card I used this months add on stamp set called Little Cupcake, a piece of patterned paper from the On Trend 6x6 paper pad, the pearled teal cardstock, and the tan seam binding ribbon. Step 1. 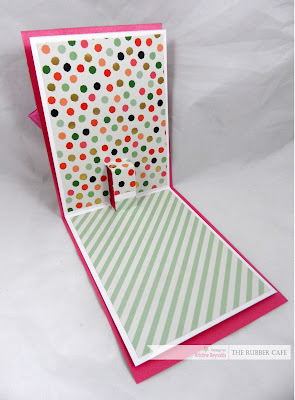 I started by folding an 8 1/2" x 5 1/2" piece of teal cardstock in half to create the card base. 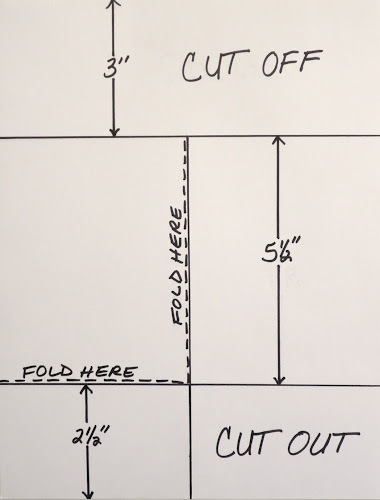 Once folded your card base will measure 5 1/2" by 4 1/4". Step 2. Cut a 4 1/2" x 2" piece of patterned paper from the On Trend 6x6 paper pad. I used the patterned paper with the colorful triangles. Step 3. Cut and add a 4 1/2" piece of tan seam binding ribbon to the upper half of the patterned paper, stapling the ends with a stapler. Take another piece of tan seam binding ribbon and tie it into a bow, set aside. Step 4. 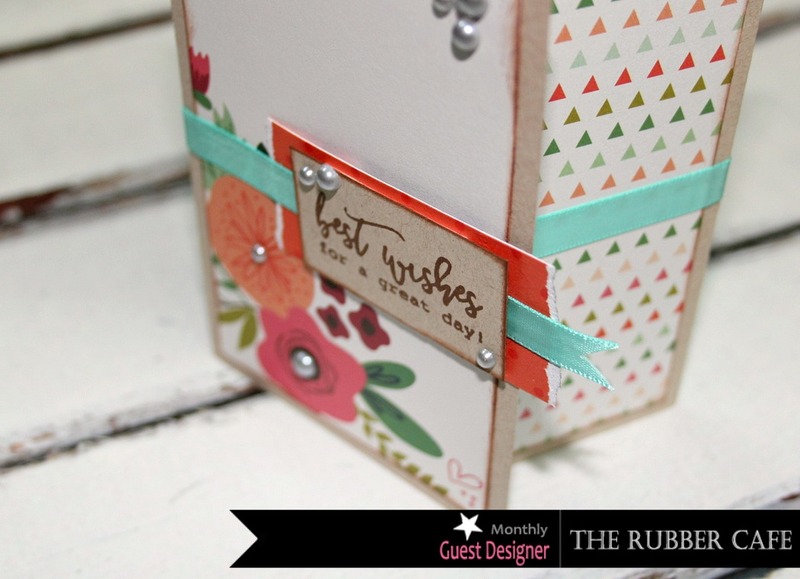 Adhere the patterned paper panel with the stapled seam binding ribbon to the bottom half of your teal card base. Step 5. 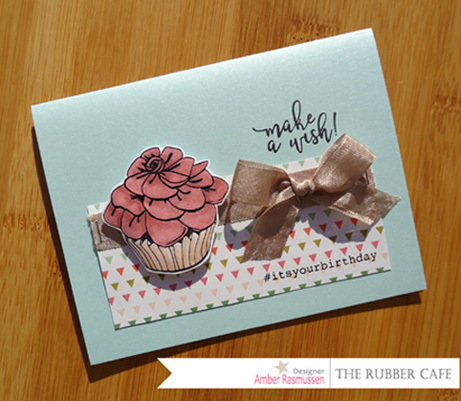 Stamp the "Make A Wish" sentiment towards the right side of your card above the adhered patterned paper panel. 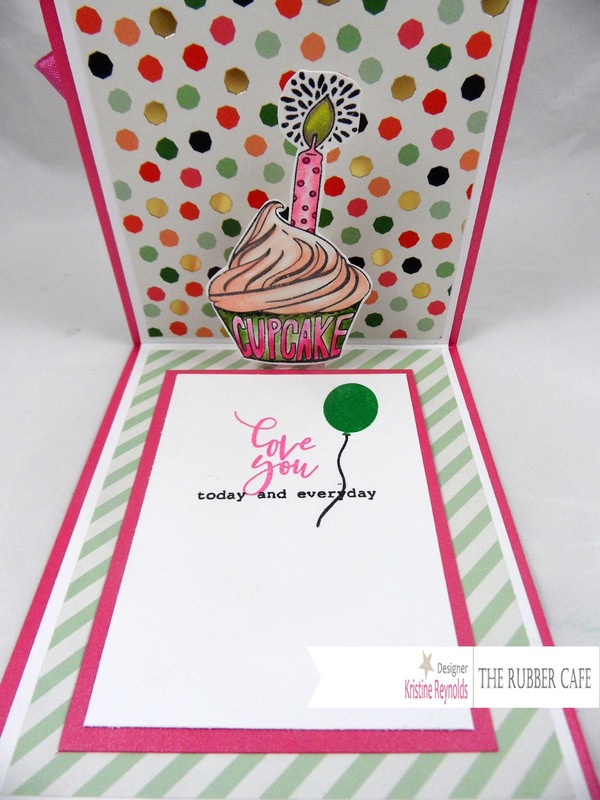 Stamp the #Itsyourbirthday sentiment toward the bottom right side of your patterned paper. Step 6. 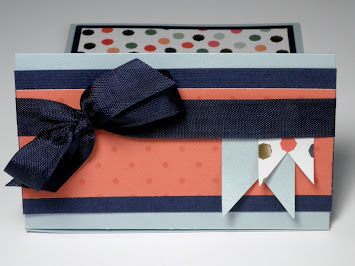 Add the tan seam binding ribbon you tied into a bow with some double sided adhesive right below and the stamped "Make A Wish" sentiment, over the stapled piece of ribbon. Step 7. Stamp the flowered cupcake from the Little Cupcake stamp set onto some white cardstock, fussy cut, and color. Step 8. 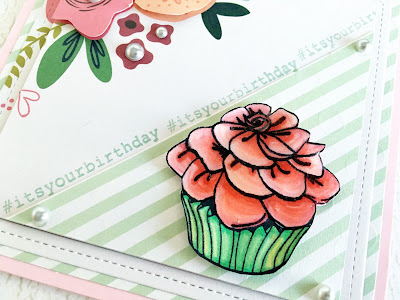 After my cupcake was colored and fussy cut I took the Clear Glaze Gelly Roll Pen from Sakura that is included in this months kit and added glaze to the entire top part of the cupcake. The glaze added a smooth shiny coating to my cupcake top. You can see a close up below. Step 9. 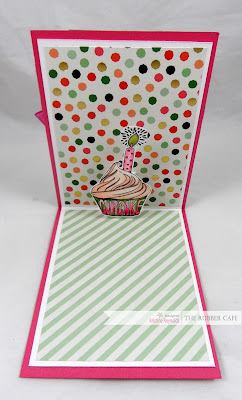 Adhere the decorated cupcake to your card front with some 3-D foam tape or pop dots and your finished. I'm so happy with the way this card turned out and it was so fun to create. All the supplies I used today except the ink pad, markers, and stapler can be found in this months Special Celebrations Creative Cafe KOTM. Thanks for stopping by today! 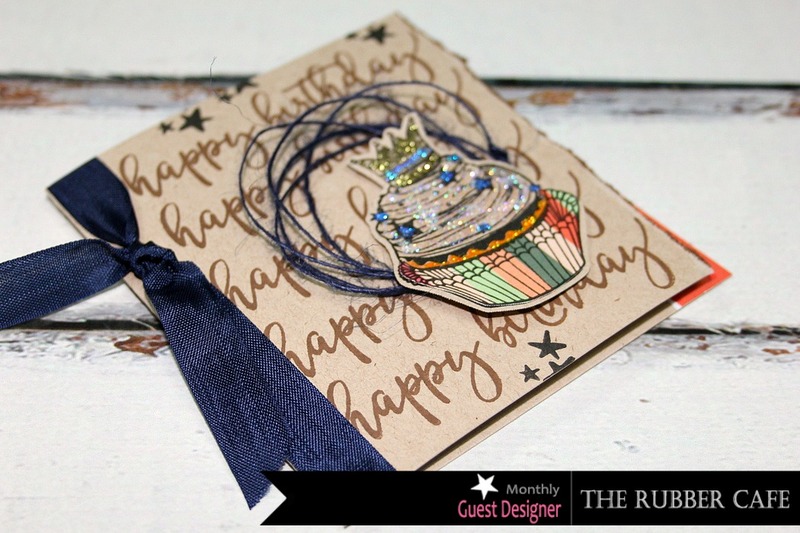 I am so excited to share my first project that I made with the March Rubber Cafe' Creative Cafe' Kit of the month, Special Celebration. The fun part is when you open it up and another cupcake pop outs! 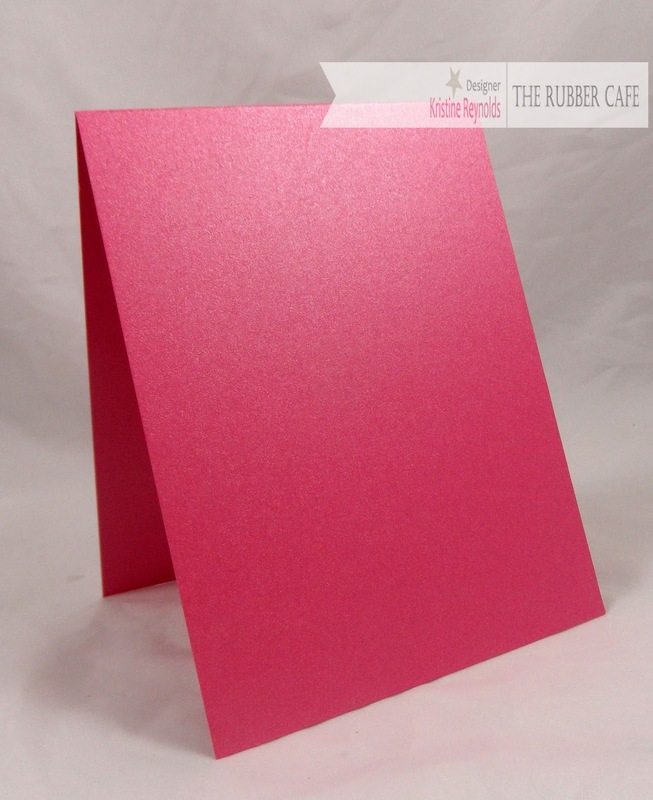 To create my card I started by folding an 11" x 4 1/4" piece of pink cardstock from the kit in half to create the card base. Cut the first panel 5 1/2" x 2 1/4" and back with a slightly larger beige panel. The second panel measures 4 1/4" x 2" and was backed with a slightly larger beige panel. The third panel measures 3 1/2" x 1 1/2" and was backed with a slightly larger beige panel. Adhere the first panel to the center of the card with Scrap Happy Glue. Stamp the sentiment on the bottom of the panel with black ink. Tie ribbon around the second panel. Then adhere it to the card with Scrap Happy Glue. Adhere the third panel to the card with Scrap Happy Glue. 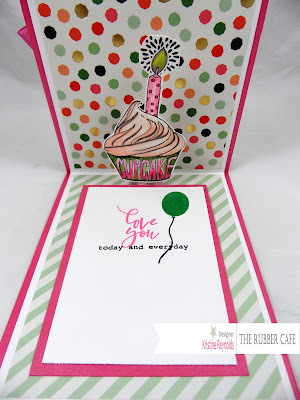 Finally, stamp the cupcake on a white panel and color with pencils. 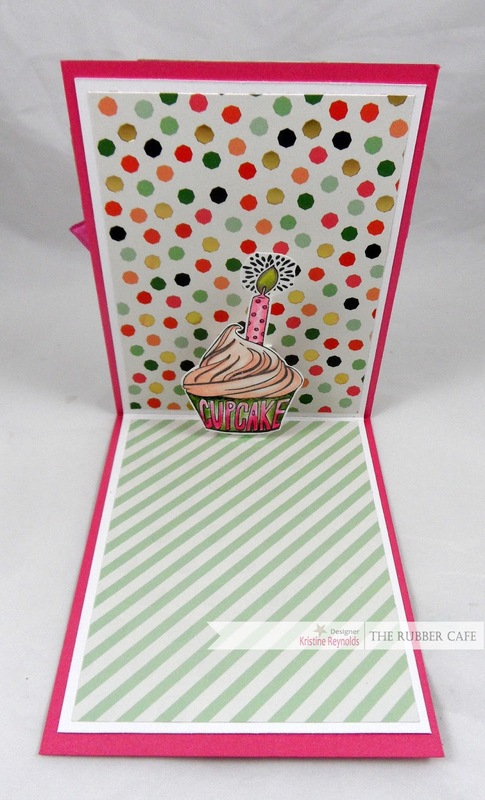 Then cut the cupcake out and adhere to the card with 3D Foam. To create the inside of the card I cut a 4" by 10 1/2" piece of white card stock and scored it in half. I adhered a 3 3/4" x 5" piece of polka dot paper to the top portion and a striped panel the same size to the bottom portion. 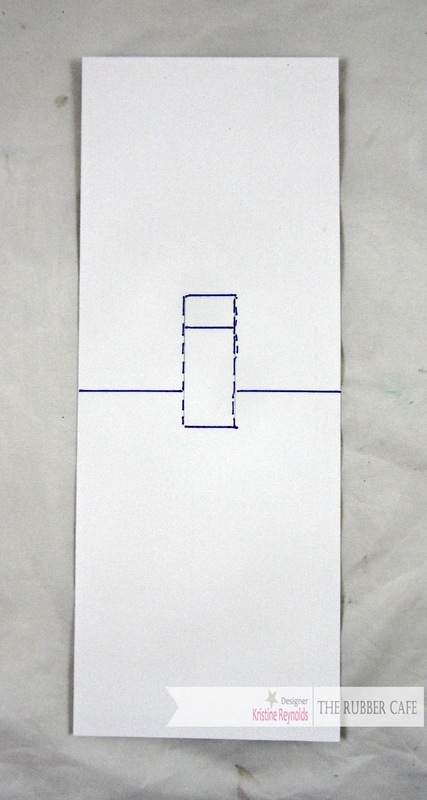 On the back side score on the solid lines and cut on the dotted lines. The dotted lines are about 1 1/2" in from each edge. The top score is 3 3/4" from the top and the bottom score is 4 3/4" from the bottom. Adhere this panel to the inside of the card with Scrap Happy Glue. 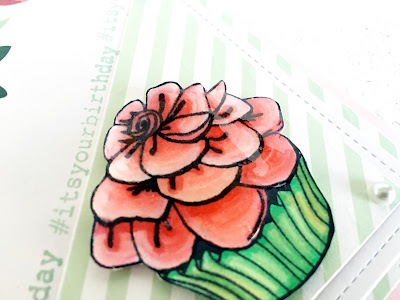 Stamp cupcake on white cardstock and color with pencils. Cut out the cupcake and adhere to the popped out panel. I added the inside panel. Outside edges measure 3" x 4"
This card is super easy to make and the recipient will be so impressed!